I can’t explain it, but I always love going to the Cambridge Brewing Company (“CBC”). I don’t go often, but every time I go, I wonder why I don’t come more often. The ambiance is relaxed and casual (they sometimes have jazz on Sunday mornings! ), the food and beer are great, and the prices are very reasonable. Furthermore, you can almost always get seated without having to wait. CBC is located in One Kendall Square, a bustling area full of shops, businesses, and a movie theater. 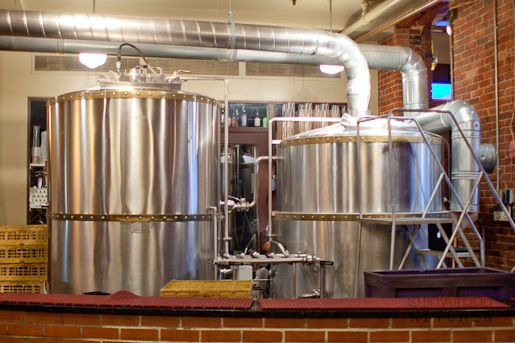 CBC has been open since 1989, and it was the first “microbrewery” in the Boston area, and one of the first in the US. There used to be countless breweries all across America. Pre-refrigeration days, all beer was brewed locally because it could not last if transported. During the Prohibition, many small and large breweries in the U.S. went out of business. After the Prohibition and into the seventies, most of the remaining breweries had consolidated into a few large companies, such as Anheuser-Busch and Miller. These large companies brewed a rather uniform and mild tasting lager. It was but a shadow of the many types of craft beers just across the pond in Europe. In light of this environment, people who craved the stronger, fuller tasting beers typically found in Europe started brewing beer at home. By the eighties, the microbrewery movement really began to take off, with CBC opening in 1989. CBC focuses on what they call “imaginative cuisine” with a focus on local ingredients. They develop relationships with local farms and purveyors and try their hardest to use local, New England ingredients when possible. They also serve fair-exchanged coffee. The Hearty Chicken Stew with cabbage and potato dumplings ($11) was indeed hearty and flavorful on a cold, rainy day. The Vermont Duck Confit and Beet Salad was also pretty good. The duck confit was quite flavorful. The salad also had fennel, frisee, arugula, and spicy pumpkin seeds all tossed together in a cranberry-orange vinaigrette – a really nice value at $11. One member of our party got the Local Omelet with Home Fries and was a bit disappointed. He didn’t elaborate except to say that it wasn’t a normal omelet like he was “used to”. The omelet contained eggs from Verrill Farms (local), hen of the woods mushroom, goat cheese, and grilled pear. I guess it’s definitely not a typical omelet, and may taste weird if you’re expecting a normal omelet. I didn’t try it, so I can’t personally comment on it. We ordered the fried calamari appetizer as well. The first time we got it, it was actually quite cold. Really unacceptable. The waitress was very accommodating and quickly brought us a new one. The new one tasted much better. I thought the dish was borderline too salty, but over all it was alright. In general, I like how the portions aren’t too big. I can actually finish my entire entree and just feel satisfied, not gross. Of course, CBC also make great beer. We ordered a “Tower of Beer,” trying the seasonal Great Pumpkin Ale, which was delicious. It was malty, not too bitter, with just a hint of pumpkin. We drank it up. It was only $31 and easily filled 8-9 glasses. Sounds like a fun place! There are a few places here that I like for similar reasons–the food isn’t necessarily the main attraction, but it’s pretty good and atmosphere, price, and being able to walk in sans reservation or wait is awesome. The food sounds wonderful and it’s good to know the waitress swapped that calamari out immediately. Nothing worse than cold, soggy, fried calamari. We have a local brewery in town and I may have to stop by to try their pumpkin ale. Thanks for sharing!